Rebecca’s friend, Anna Beth Gawarecki, is a junior at North Carolina State University studying fashion and textile design. Her inspiration for this piece was the industrial, antique vibe of Cone Denim’s White Oak Plant. The denim used in each of the pieces was selvage denim, which can only be made on the antique weaving machines at the plant. 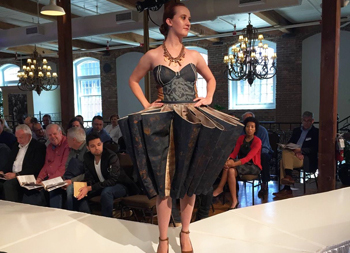 To make this dress Anna Beth used laser etching, rust dyeing on the denim fabric and nuts and bolts for embellishment. She used more than 10 yards of denim to create this gorgeous piece — and it weighed several pounds! We want to hear your feedback! Tweet us and tell us what you think of the design!